First Line: It's always darkest before the dawn. For nearly six years, the "Mercedes Killer," Brady Hartsfield has been in a persistent vegetative state in the Lakes Region Traumatic Brain Injury Clinic. Checked on periodically to see if he's fit for trial, Hartsfield has pretty much been written off as a permanent vegetable. However, he's been filled with experimental drugs for quite a while now. The lights may appear to be off, but someone is most definitely home, and he's been spending his time planning. Yes, indeed-- Brady Hartsfield is about to embark on a brand-new reign of terror. Not only does he intend to bring death to thousands of innocents, Hartsfield is also wanting revenge, and retired police detective Bill Hodges is right at the top of that particular list. 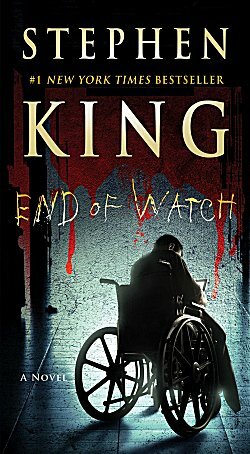 End of Watch is a very fitting conclusion to Stephen King's masterful Bill Hodges trilogy. I enjoyed every single page of all three books. Super villain Brady Hartsfield is pumped full of pills, he's pumped full of hate, and he's pumped full of powers that he's never had before. If someone doesn't catch on quick, the damage he could do is well beyond all imagining. Who can possibly fight him? One rundown, old ex-cop named Bill Hodges who's just about reached the end of his trail. I don't think anyone can write about the fight between extraordinary evil and ordinary good better than King. For decades, this man has made us believe in the unbelievable. He's scared us spitless. He's made us cheer on his ordinary heroes. He's made us laugh. He's made us cry. He's made us want to join in the fight. End of Watch-- and the entire Hodges trilogy-- had me hook, line, and sinker. If you haven't read them, pick up Mr. Mercedes and board the Stephen King Rollercoaster. You'll be in for the ride of your life. It sounds like a potent story, Cathy. And King really can notch up the tension. Glad you enjoyed it. There's a very good reason why King has sold so many books! I liked this trilogy, but I didn't love it. You're right about how well he writes about evil. He is the only author I know of who scares me and gives me nightmares. He's given me some classic reading moments over the years.